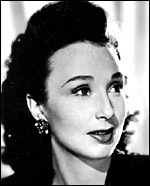 Just 73 years after her London debut in 1929, the great Googie Withers (born Georgette Lizette Withers in Karachi, India) was starring in London's West End, in Lady Windermere's Fan. In between those dates, she created as indelible an impression as any actress ever has in British films, as well as working extensively on stage and TV. She began as a dancer and had little formal theatrical training, and this may help to account for the absolute ease with which she commanded the screen - she had not acquired a battery of stage technique she needed to suppress. She had minor roles in about 30 mostly minor films from the mid 1930s, but she was lucky enough to be in four of Michael Powell 's "quota quickies", starting with her debut in The Girl in the Crowd (1934) - and he was lucky to have her. Even then, she stood out from the artifice around her, with a wit and boldness, an intelligent sensuality which would make her virtually unique in British films of the period. She also has a small part for Hitchcock in the charming opening sequences of The Lady Vanishes (1938) and is Robert Newton 's girlfriend in Busman's Honeymoon (d. Arthur Woods, 1940), but the best was yet to be. It was Powell who gave her her first two serious dramatic roles in films, playing Dutch patriots (her mother was in fact part-Dutch) in both One of Our Aircraft Is Missing (1942) and The Silver Fleet (d. Vernon Sewell, 1943); she reprised her stage lead in Ealing 's film version of the J.B. Priestley play, They Came to a City (d. Basil Dearden, 1944); more than held her own with Clive Brook , Roland Culver and the incomparable Beatrice Lillie in the high comedy of On Approval (d. Clive Brook, 1944); and seized centre screen with Pink String and Sealing Wax (d. Robert Hamer, 1945), as a Victorian pubkeeper with murder on her mind. There was no other contemporary actress who so persistently created women of purpose, whether ruthless as in Night and the City (UK/US, d. Jules Dassin, 1950) or selfless like Dr Sophie Dean in White Corridors (d. Pat Jackson, 1951), or who could have so convincingly run a sheep farm as she does in The Loves of Joanna Godden (d. Charles Frend, 1947). Perhaps best of all was the complex, flawed Rose in It Always Rains on Sunday (d. Robert Hamer, 1947), who, having made her domestic bed, ends by gratefully lying in it, having watched the destructive effects of passion. Virtually everything she did from 1942 is worth discussing. Mid 1950s British cinema was no place for a lady, and she accompanied her husband John McCallum , with whom she often co-starred, to Australia and they spent the next 50 years in commuting between the stages of the two countries. She made several films in Australia and did some notable TV in Britain, starring for several seasons as the Prison Governor in Within These Walls (LWT, 1974-78) and joining a luminous cast in Ending Up (d. Peter Sasdy, 1989). She was awarded a CBE in 2001 - and not a moment too soon. Biography: My Life With Googie by John McCallum (1979).